Phil Concannon has mixed feelings about Kelly Reichhardt’s latest offering. 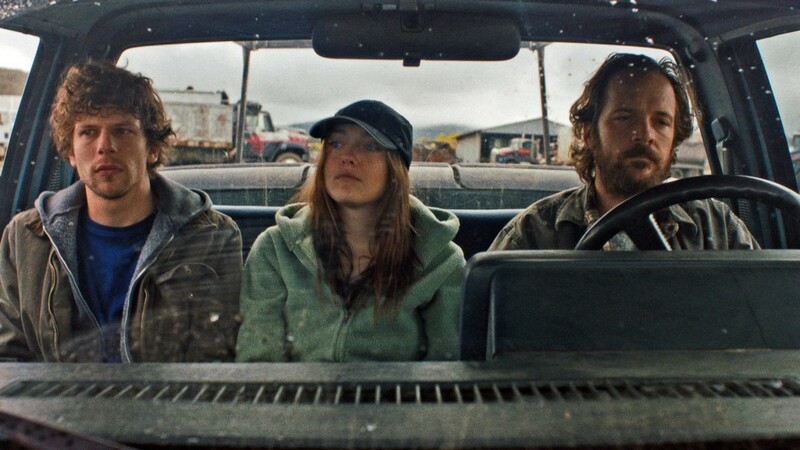 Kelly Reichardt’s last film Meek’s Cutoff was a picture about a group of people lost in the wilderness, wandering in circles as they try to find the right path. In contrast, her new film Night Moves focuses on a small group driven by a very clear and definite sense of purpose. Josh (Jesse Eisenberg) and Dena (Dakota Fanning), the two young eco-activists we follow in the film, intend to destroy a huge hydroelectric dam with the help of an ex-marine (played by the dependably sleazy Peter Sarsgaard). Reichardt’s film details their meticulous planning and the nerve-wracking execution of their plot, as well as the fallout from it, which they prove ill-equipped to handle. It’s this aspect of the tale that causes problems for the director too. Kelly Reichardt’s work to date has marked her as one of the most interesting filmmakers in American cinema, with each of her films representing an advancement on the one that preceded it. Meek’s Cutoff stands as one of the most impressive and haunting pictures of the past five years, and perhaps it was a wise move for Reichardt to make a stylistic departure at this point in her career, trying something new instead of attempting to emulate or surpass her extraordinary prior work. Night Moves is her most conventional picture to date, unfolding in a distinct three-act structure with scenes that adhere to genre conventions, but while her typically intelligent and elegant direction elevates and distinguishes the material at times, it frequently feels awkwardly unsuited to this type of storytelling. Much of the film is brilliant, however, and Reichardt creates and sustains a tangible sense of tension through the film’s first half. We see how Josh and Dena go about putting their plan into action, attempting to shrug off the enormity of what they are going to do and act in as relaxed and inconspicuous a manner as possible. All of the interactions they have with people throughout the film, such as the man from whom they purchase a boat (the vessel that gives the film its title), are mundane but underscored by a constant note of tension. One of the key scenes is Dena’s attempt to purchase a huge amount of nitrate fertiliser, where she hits an obstacle in the shape of a by-the-book salesman (a fine James LeGros cameo) who is unwilling to make such a sale without proper authorisation. Does her suspect Dena’s true intentions? Can she keep her cool and convince him? The setup for the scene is so simple but Reichardt’s assured and focused direction of it is thrillingly effective. The tension continues to build until we reach the film’s centrepiece, the assault on the dam under cover of night, which is almost Hitchcockian in its masterful construction and ticking-clock tension. We don’t see the dam burst, and instead Reichardt holds steady on the characters’ impassive faces as they drive away from the scene of the crime, with only a muffled explosion in the distance and onrushing sirens alerting us to the success of their mission. They still have some fraught encounters to negotiate, but otherwise they have done what they set out to do and the plan now is to lie low and avoid suspicion, which is where Night Moves switches its focus and the tension slowly seeps out of the picture. The final third of the film focuses largely on Josh and his difficulty in dealing with the repercussions of his actions. It’s a great role for Jesse Eisenberg, whose nervous energy and watchful eyes make him the perfect man to play a character whose life is so defined by suspicion and paranoia. Josh is prickly and withdrawn and neither Eisenberg or Reichardt ever make an attempt to make him a more likeable protagonist, which is admirable as storytelling but damaging for the movie. He is simply not a strong enough character to support the moral questions that Reichardt wants to raise in the film, and this absence of feeling makes it hard to be affected by anything that happens in the film’s latter stages. Dakota Fanning is very good as the conflicted Dena, but she is also too sketchily characterised for her actions to carry any weight. In some ways Night Moves feels like Kelly Reichardt’s biggest and most mainstream-friendly film to date, but Wendy and Lucy, an 80-minute picture about one woman and her dog, felt so much more substantial than this because we very quickly started to care about the lead character’s fate and began anxiously watching over her every move. This is where Night Moves fails, and as I watched it descend into bland thriller territory – with a generic late stalking sequence completely lacking the pull of earlier scenes – I realised I was simply watching a filmmaker tell a story that doesn’t play to her considerable strengths. Night Moves is Kelly Reichardt’s first stumble, but even within this disappointing film there are long stretches that are as provocative and brilliantly assembled as anything you’ll see on screen this year, which is a testament to just how good this director is. I still can’t wait to see what she does next. Night Moves is in cinemas today. I seem to have liked this more than most people. A big part of that is because – while I agree it loses its way after the dam – I think the very last scene, the one is the camping equipment shop, is brilliant and brought home the consequences of actions in a way that shook me up and got me thinking. It will be be spoilery to say more, but I might do another post-with-spoilers later.